Here’s an awesome deal for the runner in your life. 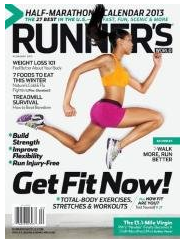 Get Runner’s World Magazine Subscription for $5.99 a year. This could be a great gift or something for yourself. You can also use the code to renew a current subscription. Enter the coupon code: SOUTHERNSAVE and order up to 4 years at this price. This offer expires tomorrow night, 11/26, at midnight.